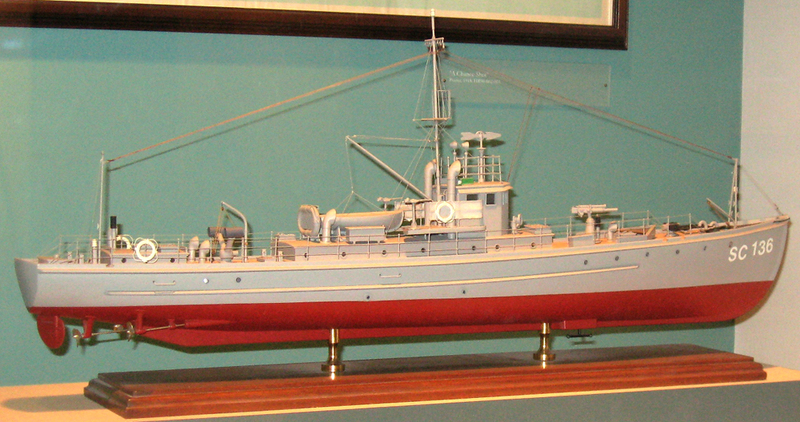 This chaser model, depicting subchaser SC 136, is on display at the Hampton Roads Naval Museum. The model was built by Tom Tragle for the museum. This chaser was the last hull number in the series built at Norfolk Naval Shipyard. It was commissioned on 13 March 1918 at Norfolk, and served in the USS Jouett Special Hunting Group, engaged in antisubmarine patrols along the Atlantic coast. SC 136 was assigned to overseas duties, and crossed the ocean mid-1918, but arrived in Gibraltar just as the Armistice was signed, and promptly returned. Model of submarine chaser SC 136, Hampton Roads Naval Museum. Thanks to Gordon Calhoun, Editor/Command Historian, for submitting the image.